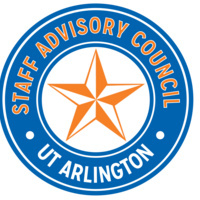 The Staff Advisory Council (SAC) is an elected group of staff members who serve as representatives of the staff at UT Arlington. The Council acts as a channel of communication for the staff and the University Administration. I heard about SAC at the New Employee Orientation and thought the group was worth checking out. I attended this meeting as a visitor so there was a little confusion at sign in since my name wasn't on the rep list but we got that straightened out. During the meeting I could tell that each person was there because they had a passion for serving their district, their University, and their community. I was glad to hear about what is going on at the University, from HR updates to parking lot renovations; this is a great way to stay in-the-know.